In 1928, Theo van Doesburg formulated the most transgressive and consistent review on neoplasticism. The design for the interior rooms of Café Aubette exposes the patterns of elementarism, a representation that progresses the neoplastic idea to a spirited dynamic against the orthodoxy of horizontal and vertical dualism. This decision of Van Doesburg produced a confrontation between the most prolific members of the group that ended up tearing down the intellectual unity of the De Stijl movement and the definitive rupture of its relationship with Mondrian. In 1925 the administrators of the building complex proposed to Jean Arp to intervene in the interior to turn the structure into a leisure center. 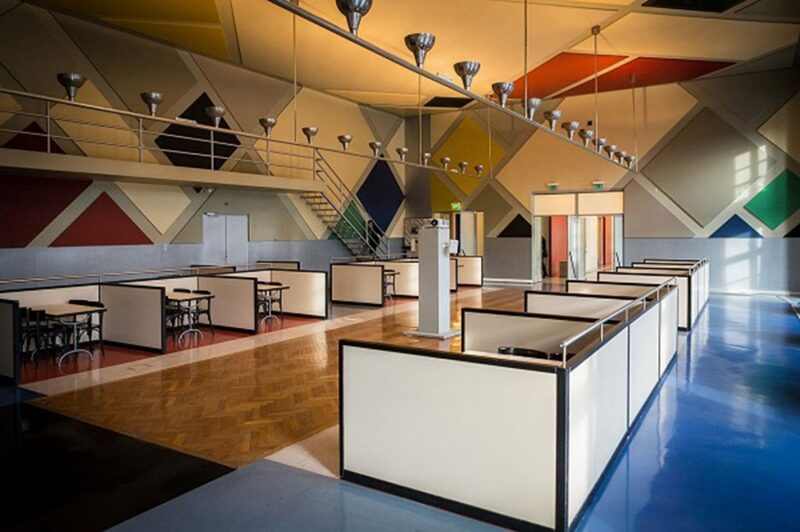 The program included a cafeteria, a restaurant, a brewery, a tea room, a cinema and other rooms, spread over the four floors of the building. 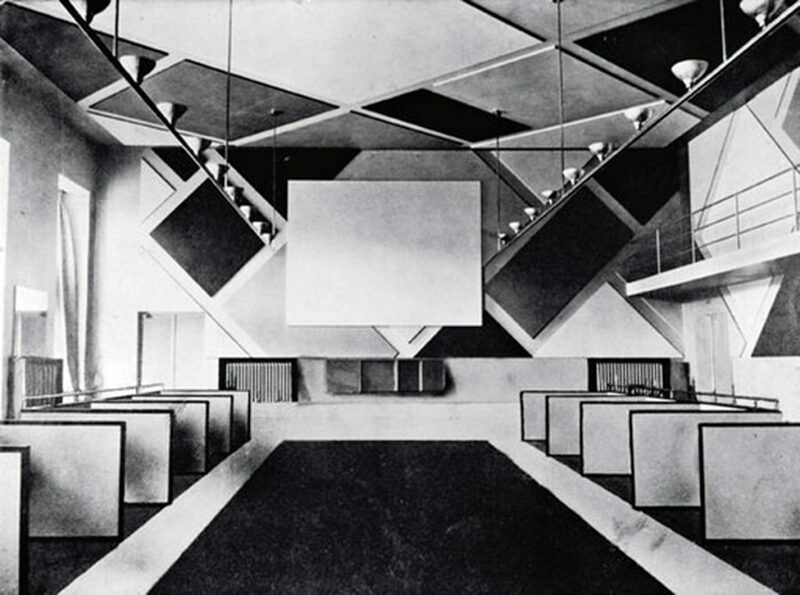 Arp summons Theo van Doesburg to solve the architectural problems arising from the intervention and also adds his wife Sophie Taeuber to intervene in some of the rooms. Theo van Doesburg understood that the design of the Aubette coffee was not only the opportunity to advance in his concept of total art, it also allowed him to produce a turn in the neoplastic conception, dogmatized by a strict orthogonal dualism that was still influenced by the Renaissance discourse. Its design proclaims the elementarist culture, which, in contrast to the orthogonal statics, represents the dynamism of the spirit as it happens in life itself. The interior of the Aubette was conceived as a space of great fluidity. A route where the boundary between one space and another could not be established with precision. 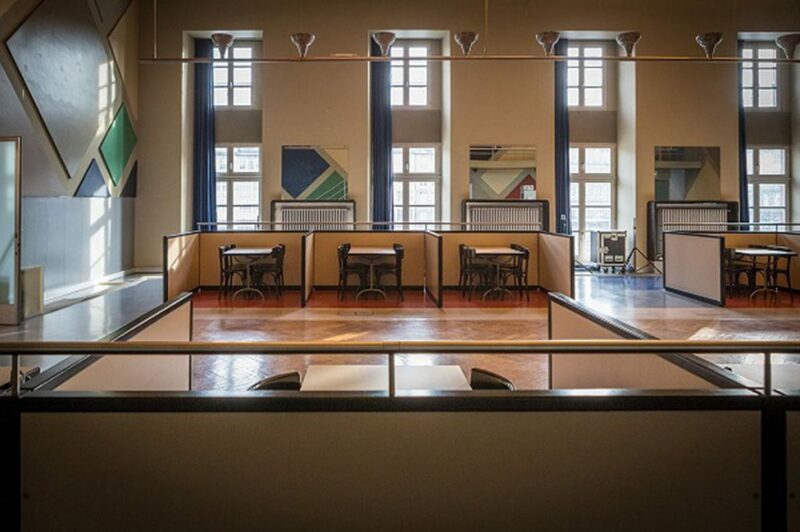 Each artist took care of designing a particular space, but Theo van Doesburg reserved for himself the most important rooms: the great ballroom and the cafe restaurant. The plan module -1.20m x 1.20m- is defined by the height of the radiators. The chromatic range maintains the neoplastic color palette: Red, Blue, yellow, black and white, and the union of shades of the same tone allows to accentuate or attenuate the brightness according to the circumstances. The elements placed in relief achieve a more strict definition of the planes and avoid visual fusion. 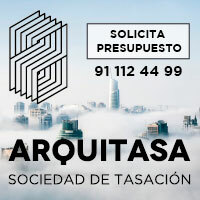 This arrangement benefits from the strong orthogonal accent presented by the openings of doors and windows, as well as the layout of the rooms themselves, promoting a “counter movement” to the presence of architecture. On the occasion of the inauguration of the room, Theo van Doesburg publishes his theory about the elementarist project in a special issue of De Stijl dedicated to the Aubette. Due to the scarce money allocated for the materialization, low quality materials were employed that undermined the expressive force of the project and attenuated the forcefulness of the plastic unit that Theo van Doesburg was looking for. This circumstance and the restlessness caused by the owners to a work too avant-garde subjected to the work to several modifications and later its destruction at the end of 1930. In 1994 the coffee was the reason of a partial restoration and in 2006 the first plant was completely restored according to the original project. In this exercise, Theo van Doesburg expresses his “supra material” thinking in three-dimensional space, assisted by the communicative potential of color and form. 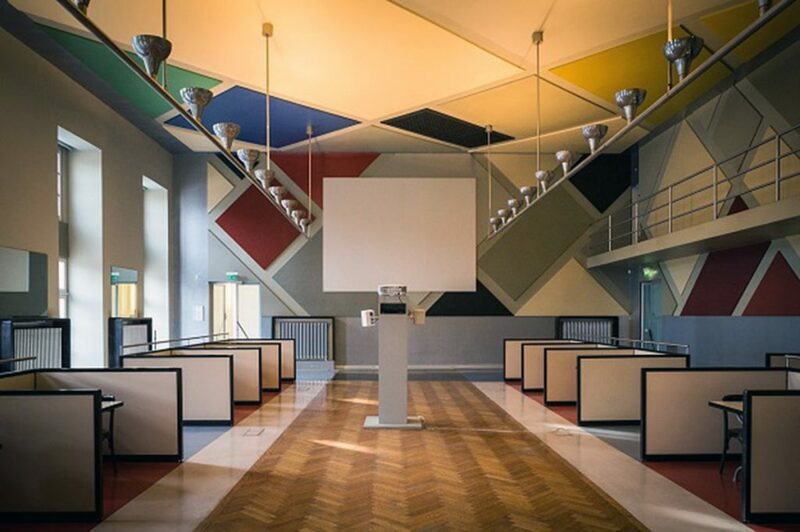 However, even assuming the revisionist position with respect to the original theories of neoplasticism, the design of the Aubette renews the artistic spirit that mobilizes the De Stijl group: the close unity between painting, sculpture and architecture.